Ernest Rhodes, right, is sworn in as Janesville's fire chief by Clerk-Treasurer Dave Godek on Wednesday at City Hall. Heralded by a bagpipe processional, Janesville Fire Chief Ernest Rhodes was officially sworn into his new position Wednesday at City Hall. The ceremony brought a close to a months-long search to find a successor to Randy Banker, who in September announced his retirement and in January left the department. The police and fire commission selected Rhodes on Feb. 20 from a group of four finalists. Rhodes’ first day was Monday. He will earn an annual salary of $115,000, plus other benefits. Rhodes comes to Janesville from Missouri, where he spent time as a fire chief outside St. Louis. He most recently served as the director of the state’s emergency management agency and also has experience on several other Federal Emergency Management Agency teams. Fire department personnel and other city officials filled the council chambers for Wednesday’s ceremony, which began with bagpipes from the department’s honor guard. City Manager Mark Freitag said Rhodes was the “right person at the right time with the right skill set” to lead the department. The city will hold him to a high standard, Freitag said. A bagpipe player performs as the Janesville Fire Department honor guard presents the colors to start the appointment ceremony for Ernest Rhodes, who became Janesville’s new fire chief Wednesday. After department chaplain Bruce Gray pinned the badge on Rhodes, the new chief gave brief remarks listing some of his career’s most memorable moments. When he first walked into a fire station as a teenager, he came home “jazzed” and knew what he wanted to do with his life, he said. Wednesday’s ceremony was the first time The Gazette was able to reach Rhodes for comment. Rhodes said he is walking into a strong fire department filled with people who care about protecting the city. Some of his top priorities include developing leadership teams and taking preventative action to reduce the risk of fire. The department will always respond to emergencies, but such preventive action could include resources and education to reduce 911 calls as well as the possibility of a community paramedic program, he said. The department has no major challenges right now, Rhodes said. Perhaps the biggest one lies in Milton. 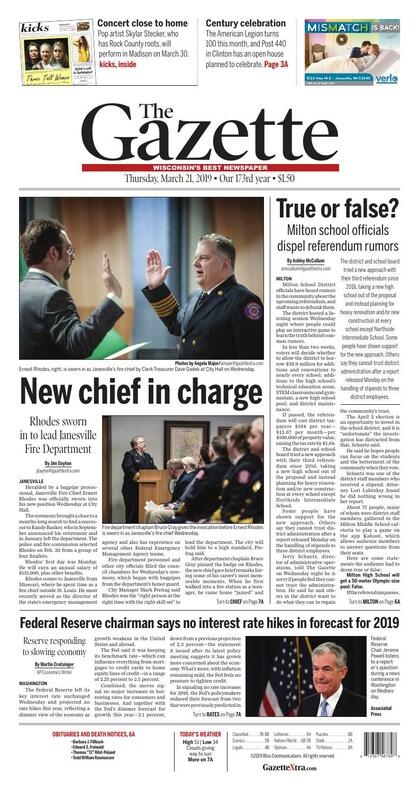 Under a shared services agreement implemented under Banker, Rhodes will also oversee the Milton Fire Department. Milton has long searched for a solution to replace its aging fire station on the city’s north side. Banker and other fire staff compiled a report in January advising against renovations to the existing building. The report recommended building a new station in Milton and possibly building a Janesville/Milton shared station on Janesville’s north side. Milton’s fire commission could still choose to ignore those recommendations and renovate. Rhodes said Wednesday that Milton needs a new station, but what that looks like will depend on funding. Rhodes is also facing a personal, legal challenge. He has a pending lawsuit in Missouri accusing him of age and gender discrimination against older women. He “absolutely, wholeheartedly denies” the allegations but declined to comment further on the pending litigation. Police and Fire Commission Chairman DuWayne Severson previously told The Gazette that the commission reviewed the lawsuit during the interview process and was not concerned. Fire department chaplain Bruce Gray gives the invocation before Ernest Rhodes is sworn in as Janesville's fire chief Wednesday. Computer-generated images of some of the proposed projects included in the Milton School District’s upcoming referendum. Milton School District officials have heard rumors in the community about the upcoming referendum, and staff wants to debunk them. The district hosted a listening session Wednesday night where people could play an interactive game to learn the truth behind common rumors. In less than two weeks, voters will decide whether to allow the district to borrow $59.9 million for additions and renovations to nearly every school; additions to the high school’s technical education areas, STEM classrooms and gymnasium; a new high school pool; and district maintenance. If passed, the referendum will cost district taxpayers $164 per year—$13.67 per month—per $100,000 of property value, raising the tax rate by $1.64. The district and school board tried a new approach with their third referendum since 2016, taking a new high school out of the proposal and instead planning for heavy renovation and/or new construction at every school except Northside Intermediate School. Some people have shown support for the new approach. Others say they cannot trust district administration after a report released Monday on the handling of stipends to three district employees. Jerry Schuetz, director of administrative operations, told The Gazette on Wednesday night he is sorry if people feel they cannot trust the administration. He said he and others in the district want to do what they can to regain the community’s trust. The April 2 election is an opportunity to invest in the school district, and it is “unfortunate” the investigation has distracted from that, Schuetz said. He said he hopes people can focus on the students and the betterment of the community when they vote. Schuetz was one of the district staff members who received a stipend. Attorney Lori Lubinksy found he did nothing wrong in her report. About 75 people, many of whom were district staff members, gathered in the Milton Middle School cafeteria to play a game on the app Kahoot, which allows audience members to answer questions from their seats. Milton High School will get a 50-meter Olympic-size pool: False. If the referendum passes, the high school will add an eight-lane, 25-yard pool that is standard in schools across the state. The pool would have an outside entrance, an observation deck and natural lighting, said Ryan Ruggles, director of curriculum and instruction. The high school will get a new gym in the referendum: False. The high school’s second gym, located next to the existing pool, would be renovated and expanded to accommodate indoor graduation, the entire student body and the show choir, Ruggles said. All referendum construction will be new additions: False. Projects include a combination of additions and renovation. The referendum includes a new high school: False. Some residents still believe a new high school will be built if the referendum passes. This is the first of three recent referendums to not include a new high school. Grade configurations will change if the referendum passes: False. Grade reconfigurations are not part of the current referendum proposal, and there is no plan to add them. Lisa Voisin of Baird, the financial firm that would help the district handle the debt repayment, said the district would not receive $59.9 million in its bank account to use however it wants if the referendum passes. The district would borrow money via municipal bonds, which would be handled by Baird and American Deposit Management, Voisin said.